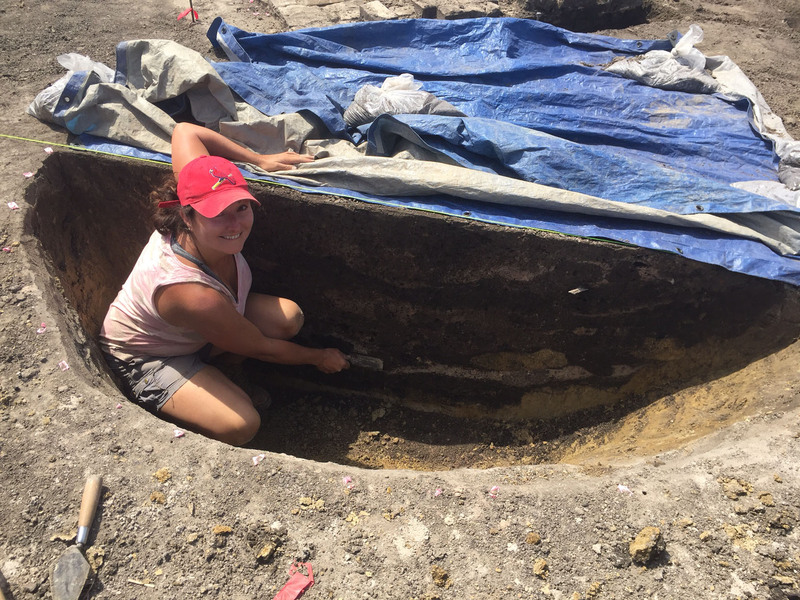 A. I first started working part-time for the Illinois State Archaeological Survey (ISAS) Central Office as an undergraduate student in 1999, when the organization was known at the Illinois Transportation Archaeological Program (ITARP). My first job was as an assistant for Janice Pankey, who I helped with administrative duties as part of the university’s work-study program. Shortly thereafter, I was moved to the lab and then the field. After graduating from the University of Illinois in 2001, I took a full-time position at the Western Illinois Field Station (WIFS). 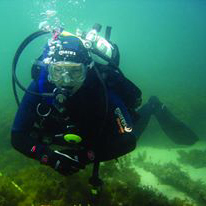 In 2005, I left ITARP to pursue a master’s degree in Maritime Archaeology at East Carolina University and a PhD in Archaeology at Flinders University in South Australia. I returned to the United States and ISAS in 2009. Since then, I have been working for ISAS in various roles and locations, including a stint as a historical archaeologist at the American Bottom Field Station, where at the time I conducted analysis on nineteenth century historic material from East St. Louis excavated as part of the New Mississippi River Bridge Project. Currently, my role for ISAS is as a compliance archaeologist who is contracted with at the Illinois Department of Transportation (IDOT) Central Office in Springfield, but as time allows I also work out of WIFS doing historic analysis, report writing, and fieldwork. A. A little unknown fact about me is that I actually flunked out of undergrad after my first year. I was accepted into the University of Illinois as an Agricultural Communications major (I grew up on a farm in central Illinois and wanted to pursue a career in journalism). I found one of my communications classes in particular so boring, and as a result had such poor attendance, that I completely failed the final – my one and only ‘F.’ The following year I attended Parkland College, where I took my first Anthropology course with Len Stelle. Not only was he a captivating teacher, but also the subject matter really resonated with me. For the first time, I was actually totally engrossed in a school subject. My grades drastically improved, and when I was admitted back into the University of Illinois the next year, I returned as an Anthropology major focusing on Archaeology. Over the years, I have explored different aspects of Archaeology – Mayan Archaeology, Prehistoric Archaeology, Maritime Archaeology, and Historical Archaeology. Though now I identify more with the latter two, these experiences, I believe, have made me a fairly well-rounded archaeologist. A. Thomas Emerson, the Director of ISAS, has been my most long-term and influential mentor. I first got to know Tom when I was working as a student at the ISAS Central Office – he always knew what I was up to thanks to his daughter and my friend Kjersti, who also worked in the lab at that time. In this way, I have always seen Tom as something of a father-figure within my professional life. Also, for some reason, after I left ISAS to get a master’s and PhD degree, Tom hired me back! Tom has always supported the furtherance of my career, be it through more education (returning to school for higher degrees) or professional training (he arranged for me to attend a number of Section 106 training sessions, including a trip to Anchorage, Alaska, where I trained with some of the best from the Advisory Council on Historic Preservation). When my (now) husband was accepted into law school at Indiana University (IU), Tom introduced me to and arranged for me to work for ISAS in Cheryl Munson’s (a pioneer woman in science) archaeology lab on IU’s campus, so as to avoid unnecessary strain upon my personal life. This past year, Tom, along with IDOT’s Chief Archaeologist, Brad Koldehoff (another more recent but influential mentor in my career), were supportive by arranging time for me to write and publish three articles in peer-reviewed journals. Their guidance (and prodding) was invaluable in getting these articles to print. Dave Nolan, Coordinator of WIFS, has also been a long-term mentor and life coach. He has helped me find direction in both my professional and personal life. When necessary, he has pointed out areas that need improvement, focusing on my behavior while harnessing my character. He has encouraged me to learn about all aspects of archaeology, to improve within myself, and to laugh during the process. Dave also provided me with my first report writing opportunities. He has encouraged my progress in school and career planning, as well as personal development. But most importantly, Dave Nolan and Rob Hickson (the Assistant Coordinator of WIFS and another long-term mentor) taught me how to dig. Rob, in particular, has shared his expertise with me about how to approach excavating historic sites in Illinois. Both Dave and Rob have been a resource and a sounding board throughout nearly twenty years that I have known them. My general outlook about maritime and historical archaeology was largely shaped by academic supervisors – Dr. Bradley Rodgers (East Carolina University) and Dr. Mark Staniforth (Flinders University). Brad helped me hone my writing skills. His words, “you don’t have to be smart, you just have to work hard,” are something that I have repeated to those whom I have trained. As for Mark, not only did he encourage me to explore new theoretical outlooks and to build my personal library on archaeology, he also taught me a few valuable lessons about the people who I would encounter throughout my career, albeit sometimes with a little humor. First, people can only work to their best ability, and it will be my job to find and harness this in students and staff so that they can succeed. Second, Mark warned me not to be a “squirrel nut keeper.” In other words, don’t keep all the recognition and knowledge for yourself. It takes a team to excavate, analyze, and report on any site. Share what you know with those around you, be inclusive, give praise where it is deserved. Finally, Mark warned me not to fall victim to the “beaten wife syndrome.” In simple terms, many students, PhD candidates in particular, are treated like their degree is a right of passage; they are essentially sub-human until awarded a degree. As a result when those students become teachers, they too treat their students and those still working toward their degrees in the same way. This can be also true of those who do not go to school but instead come up through the system. He tasked me with breaking this cycle. A. Fieldwork, hands down. Though once you reach the level of PhD, fieldwork opportunities become few and far between. At this level we are expected to analyze, write, and/or teach. It is a good day when I do get to go into the field. Fieldwork has always provided a sense of grounding for me. There is nothing more gratifying than excavating the first half of a historic cellar and ending the day gawking at its beautiful profile. Plus, fieldwork is always a great workout that helps release endorphins. A. The sciences and archaeology in particular has traditionally been a male-dominated field. It has only been the past twenty or so years that women have begun to break the glass ceiling, with more and more women in supervisory and administration roles, in teaching roles, and owning their own companies. Despite these great strides for women in science, patriarchal cronyism too often remains the white elephant in the room. My first bit of advice to other female scientists is that you do not have to play the game. Persist in your pursuit of personal achievement. Create your own network of colleagues who will build you up, who will provide equal opportunity, and who will inspire you to be your best, not just at work, but in all aspects of life. Second, as a working woman, I have many personal and professional roles throughout any given day, and these roles have changed through time – student, professional, roller derby teammate, fiancé, wife, mother. With these changing roles, it is important to find balance in all aspects of life, to be your own advocate, and to not be afraid to make a change if something is not working just right. Last, publish, publish, and publish. This is one area that we could all do more of, myself included. A. Wow, that is a difficult question, and I would say that this has changed over time as my career has progressed. My master’s thesis Oaken Whale with a Cast Iron Tail: The Single-Decked Wooden Bulk Carrier Monohansett was at the time the most engrossing long-term project that I had undertaken. My thesis was ultimately published as a research report for the Program in Maritime Studies at East Carolina University. The project was undertaken as part two-week field school that documented the Monohansett’s 165-foot wreckage resting in about twenty feet of water in Lake Huron’s Thunder Bay National Marine Sanctuary. The project was partly funded through a National Oceanic and Atmospheric Administration Maritime Heritage Program Mini-Grant (co-author). Our work in Thunder Bay was also featured as part of a Great Lakes shipwrecks series on the History Channel. My dissertation entitled The US-China Trade: Capitalism, Consumption and Consumer Identity examined the cargo excavated from shipwreck Frolic (1850) to discuss how those involved in and those who were supplied through the nineteenth century US-China trade used a range of consumer goods to construct distinct identities for themselves and those around them. Not only did I receive a full-ride scholarship to conduct my dissertation research, but I was also the recipient of a Flinders University Overseas Travelling Grant that allowed me to travel abroad from Australia to work with the PAST Foundation’s (https://pastfoundation.org) artifact database, which was a record of the shipwreck cargo that was excavated and during one of their field schools. 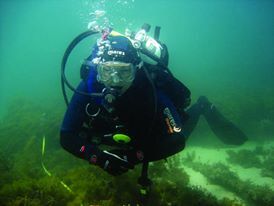 During my candidature, I was also a part-time lecturer in the Department of Archaeology and had the opportunity to dive numerous shipwreck sites throughout Australia, as well as to participate in the Sydney Cove shipwreck survivors’ camp excavations on Preservation Island, Tasmania. So I am proud not only of writing this dissertation, but also of the varied life experiences that naturally came along with undertaking a degree halfway around the world.